Facebook is buzzing with news about the kindness and generosity of the Roma Police. Last week, officers responded to a call in Rome after someone reported hearing crying and shouting coming from an urban apartment. 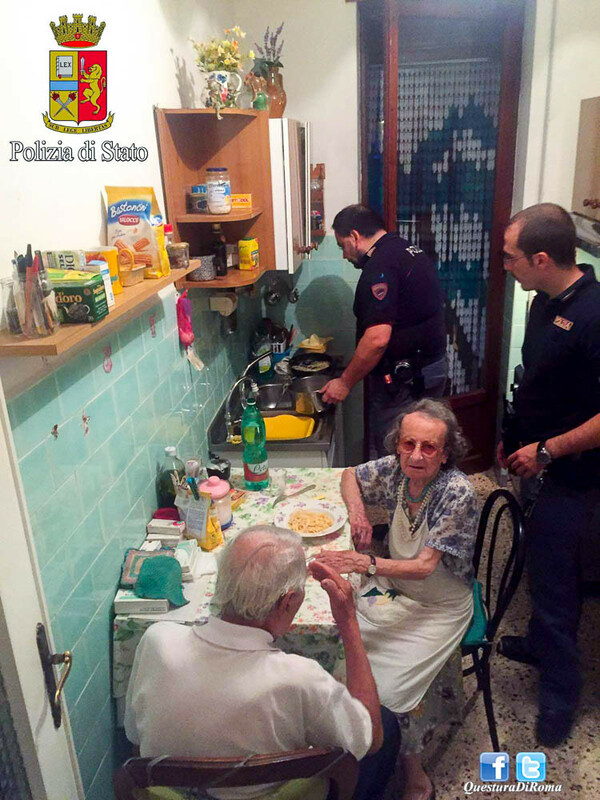 When the police arrived, they were met by 89 year old Jole and her 94 year old husband Michele. The Italian couple explained that their tears and wailing were not because of a crime having been committed, but rather because they were overcome with loneliness and recent tragic news events in Italy. 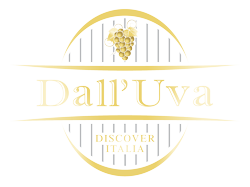 August is Italy's holiday month, when many Italians head to the beach or the mountains, and cities like Rome can be desolate with shops closed and apartments silent. For those who remain, it can be very lonely. 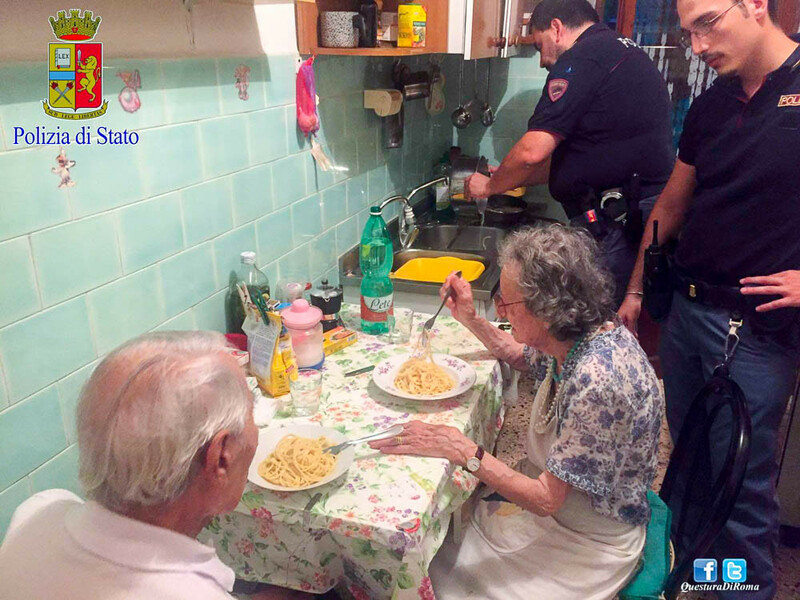 To help calm the distraught couple, who have been married nearly 70 years, the police officers decided to cook them a simple meal of spaghetti with butter and parmesan, and share some time with them. Rome Police post translated from Italian. It is a sultry Roman summer. Jole is at home. Like every night. For far too long. On the television the news flows, distracting. Attacks, abused children in a kindergarten. 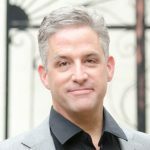 Joel wonders why there is so much evil. Yes, Michael, who is 94, is her man for nearly seventy years. She, who has experienced 89 springs of her own, she will remember this night to tell others. But who can she tell? No one comes to greet them. Especially when the city empties and the neighbors are away on vacation. Sometimes loneliness dissolves into tears. Sometimes it's like a summer storm. It comes suddenly and overwhelms you. Jole and Michael are in love together. But when loneliness burdens the heart, it can cause them to lose hope. It can happen, as it has this time, that they shout their despair so loudly that eventually, someone calls the Police. There is no crime. Jole and Michael are not victims of a scam, as so often happens to the elderly, and no thief has entered their home. There is no one to save. There are two lonely souls that need to be reassured. Once inside their apartment, everything speaks of their long life together. But it also speaks of the desolation they experience. A measly stalk, from which hangs just 3 shriveled grapes, on the kitchen table, tells of a fasting that has lasted for too long. The police are overcome with tenderness. They understand that this time is different. There are no forms to fill out. This evening the report codes are not needed. This evening instead needs men. And while waiting for the paramedics to ensure that the couple are well, the men understand that just a little human warmth will restore tranquility to Jole and Michael. They ask for permission to access the kitchen pantry. They improvise a modest dinner. A plate of pasta with butter and cheese. Nothing in particular. But with a precious ingredient: Their humanity and kindness. Andrea busy in the kitchen while Alessandro, Ernesto and Mirko entertain their two new friends. This evening it is a family dinner! This too is #essercisempre (“to be there always"), and for every time that someone asks us for help.